When my uncle's family in upstate New York babysat me as a kid, I'd get a chance to look into my adopted uncle's collection of Castle of Frankenstein magazines. These were a portal to old school sword & fantasy films ages before the easy access to Beta Max or VHS. So I came across a particular issue of Castle of Frankenstein that I've been looking for sometime last night. Castle of Frankenstein was a monster kid's dream, sure Famous Monsters of Filmland gets all of the top billing today. 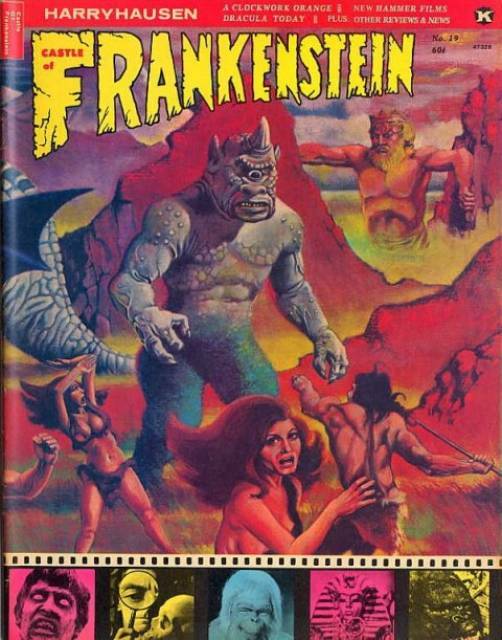 But Castle of Frankenstein had some very awesome cover artwork but it was hard to find growing up. 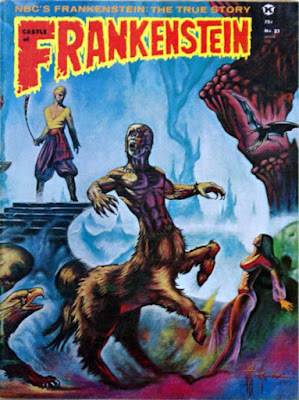 There were reasons for this;"
Castle of Frankenstein was an American horror, science fiction and fantasy film magazine, published between 1962 and 1975 by Calvin Thomas Beck's Gothic Castle Publishing Company, distributed by Kable News. Larry Ivie - who also was cover artist for several early issues - and Ken Beale edited the first three issues. Writer-artist Bhob Stewart edited the magazine from 1963 into the early 1970s. Although promoted and sold as a "monster magazine," readers were aware that Castle of Frankenstein, at the time, was the only nationally distributed magazine devoted to a legitimate and serious coverage of B movies. In addition to its central focus on classic and current horror films, Castle of Frankenstein also devoted pages to amateur filmmakers and fanzines. Its advertising pages sold full-length silent feature films such as The Lost World and The Golem. Following employment as an editor for publisher Joe Weider, Calvin Beck (1929–1989) entered the monster magazine arena in 1959 with his one-shot Journal of Frankenstein, which had only a small circulation. As an experiment, Beck printed part of the run on slick paper. After a hiatus and a title change, Beck returned with the debut issue of Castle of Frankenstein in 1962. Beck claimed that since his magazine carried no outside advertising, a standardized schedule was unneeded. Issues were published whenever they were completed, leading to an erratic, irregular schedule. Distribution also varied; while many well-stocked periodical outlets did not carry the magazine, some less-likely outlets (such as grocery stores) did." So issues number Nineteen, Twenty, & the infamous issue Twenty One of Castle of Frankenstein featured amazing covers by Maelo Cintron. Whose horror covers have graced comicbooks & horror magazines for decades such as Skywald as well as many others. Thanks to Monster Brains you can some fantastic scans of the wonderful covers of these vintage rarities. So after many years of not having access to these treasures of the Seventies I finally came across these three treasured issues which contain a running interview with the master of stop motion Ray Harryhausen. The wrap around covers are worth the price of admission but this interview covers many of his early film endeavors. Plus with the added bonus of these fantastic wrap around covers for old school adventure inspiration. This issue has lots of key behind the scenes photos from on set stuff & more. Its some great stuff for a trip down memory lane and nostalgia alley. Plus there's a ton of good material for stimulating the imagination. 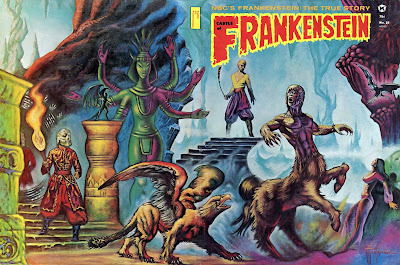 The final issue of Castle of Frankenstein 021 covers Sinbad and more of the Seventies leanings of Mr. Harryhausen plus a whole lot more monster movie magic!